The dodo – a large, flightless bird – only ever lived on the island of Mauritius, in the Indian Ocean. It became extinct around 350 years ago, shortly after humans discovered the island. Other species were reduced to a mere handful (see Mauritian kestrel below). Today WVI gives practical advice, training and support to local efforts aimed at rescuing other unique native species from the brink of extinction, crucially making sure that the risk of disease is minimised. In recent years a huge amount of work and effort has gone into saving species like the Mauritian parakeet (also known as the echo parakeet), the pink pigeon and the Telfair’s skink (above). Numbers are still low, they wouldn’t survive without human input and they are still at serious risk of extinction from disease. Mint is so very easy to grow at this time of year, why don’t you plant plenty of it in a large pot, keep well watered and make sure it gets plenty of sun. It is then super easy to harvest, dry and put in cheese cloth tea bags. Present it prettily and give as a gift! Harvest your mint, rinse, dry and take off any discolored leaves. Lay on a baking tray and put in oven for 1.5 – 2hrs. (Alternatively you can tie bunches of mint and hang it for a week or so in a warm dry place). Once the leaves are completely dry, but not cooked, carefully remove the leaves and very gently crumble. Store in an airtight container until you are ready to use / make it into tea bags. Fill each cheesecloth square with 1- 1.5 teaspoons of mint. Gather the top and tie tightly with your cotton string. (you can loosely stitch if you prefer). Make a tag using craft punches and card stock. Punch a hole in the center of each tag. Thread tea-bag strings through each tag, and knot. 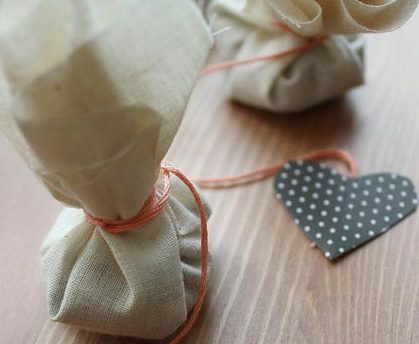 Decorate the gift box / jar and make sure you let the recipient know to keep the teabags airtight until used. NOTE: the dried loose leaves and teabags need to be kept in an airtight container or the mintiness will evaporate.